The four cherry trees along the pond just south of the torii in the Japanese Hill-and-Pond Garden look similar—all have a weeping habit and pink flowers that blossom at the same time. They are clearly of different ages, but everyone thought they were the same cultivar—Prunus subhirtella ‘Pendula,’ which is how they were labeled when they arrived from the nursery. But a recent examination reveals that one young tree’s flowers have a double layer of petals, indicating that it is actually a completely different cultivar: P. pendula ‘Yae-Beni-Shidare’. Names matter at a botanic garden. 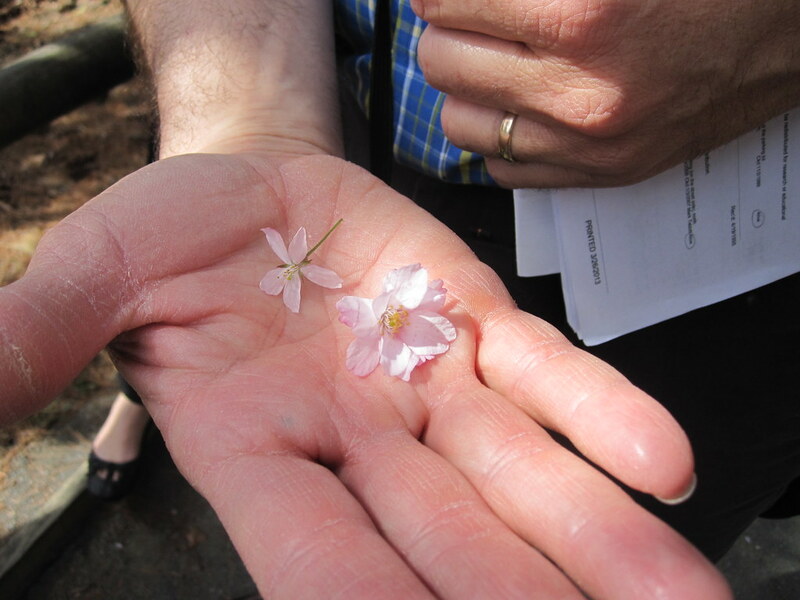 So this spring, Brooklyn Botanic Garden enlisted Tony Aiello, a horticulturist from Morris Arboretum in Philadelphia with special expertise in cherry trees, to help confirm the identifications of the flowering cherries in BBG’s collection. The term cultivar is contracted from “cultivated variety,” meaning a subset of a plant species that has been selected for certain desirable characteristics—color, flower size or shape, or fragrance, for example. The cultivar name that identifies this subgroup follows the species’ Latin name and is set in single quotes. Breeders often come up with metaphorical descriptors (like Tulipa ‘Red Riding Hood’) or celebrity tributes (like Rosa ‘Lady Diana’) to distinguish their plants. When a cultivar is accessioned into BBG’s collection, the specimen is tagged with the full name, which is also recorded in the Garden’s plant records database. In the case of Japanese cherry trees, cultivar naming can be an imprecise science. Japanese horticulturists tend not to use Latin binomials, and cultivar information can be lost in transliteration from kanji to English. Further compounding the confusion is the fact that the first major account of cherry cultivars was published in German, opening the door for more translation variations. Once a specimen has been misidentified, it takes an expert eye and close observation at the right time of year to discover the error. Aiello has been working to help ensure that different collections around the country are using a common set of names—he tries to visit a few each spring. This year he’s also been to Washington, DC, to examine the National Arboretum's cherry trees. (Being a traveling cherry cultivar expert is a pretty sweet gig, he admits.) He’s planning one more visit to BBG this week, now that the late-flowering cultivars have blossomed. So far, he’s found the collection to be in pretty good order, but some updates will likely be made to the Garden’s records, plant labels, and Cherry Watch. I live in Cypress Hills, Brooklyn, on Autumn Avenue. Our block currently has four cherry trees. The one in front of my house is different from the others. The flowers are white on the top and small. Only one branch, toward the bottom blooms in pink. Last year the white flowers produced little cherries. None of the other tress has had them. Is it that one tree blooms in two different colors and type of flowers? I wish he’d come to Astoria Park in Queens and identify and label all the trees. I have identified a few but could definitely use an expert. Many characteristics can be used to identify particular cultivars–size, color, and shape of the the flowers, the number of petals or rows of petals per blossom, and fragrance. Here, Aiello is looking at different sepals, which may be smooth or serrated. Photo by Elizabeth Peters. 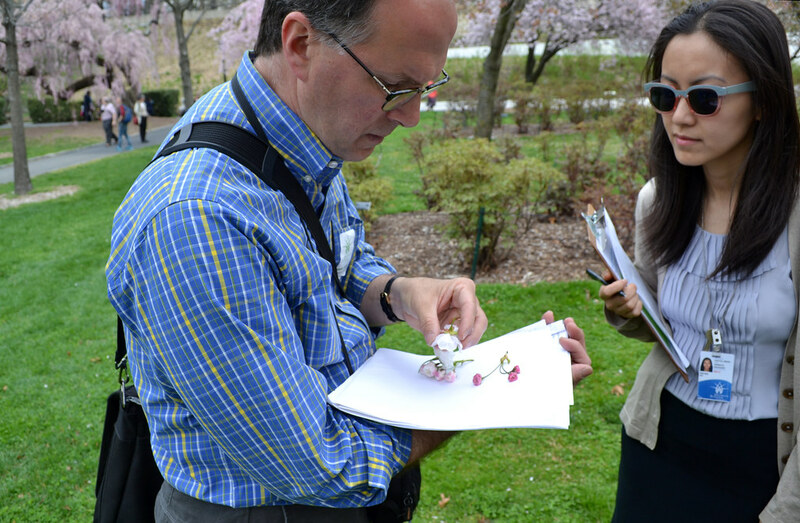 BBG staff accompanied cherry cultivar expert Tony Aiello of Morris Arboretum in Philadelphia as he examined the Garden's cherry collection. Photo by Elizabeth Peters.